The Zip and Splash crew headed back to the Nantahala Outdoor Center this morning for another round of "high" adventure. 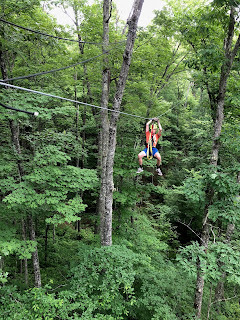 This time we were set to tackle the eight zip lines at the top of the mountain above the NOC. Our scheduled arrival time was at 8:30 AM, which meant that we had to leave Camp Daniel Boone by 7:00. Since this did not allow us the time to eat breakfast, we hit the road with a boxed breakfast consisting of a biscuit, egg (synthetic), chicken patty, and an apple fritter. This hit the spot and gave us the energy needed for the morning ahead. 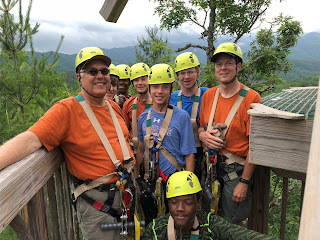 When we arrived at the NOC, we were met by the adventure program director and the training director. They had been in communication with the scout executive for the Daniel Boone Council about the accident from yesterday. They listened to our concerns and offered their assurances that they were working hard to ensure that such an accident could not occur again. 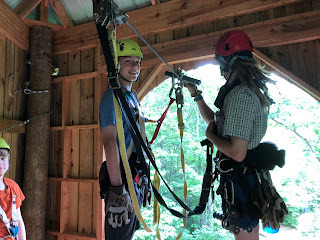 They also wanted us to know that the zip line program we were about to do was safe and staffed by well-trained guides. This was certainly the case. We had three, very good guides, one of whom was a trainee, who were well informed and provided us with an excellent experience. Our group is geared up and ready to begin our training. We were outfitted with full body harnesses and helmets, along with the safety lines and pulleys needed for the zip line cables. After a short drive up a very steep road, we came to the start of the course. 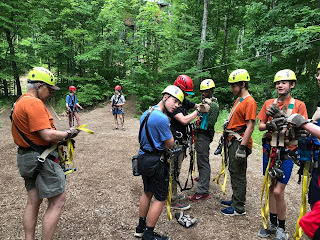 We began with a session that provided us with the instructions for how to zip and most importantly, how to brake as we came to the end of the line. After a demonstration by one of the guides for how to do all of this, we were hooked up to a low, short cable and allowed to slide down the line and brake. This let us see what it was like before we got to the real thing. Hunter is hooked up to the first line by our guide Chewy. His hairdo is the source of his nickname. Trey prepares for a landing at the end of the second line. We climbed a stairwell up to a treehouse that was the starting point for the first line. Each of us was hooked to a safety line that ensured we were always hooked into something. One of the guides went down the line first to assist us as we came to the end of the line. The second and third guide maintained contact with him with a walkie-talkie. They then got us hooked up to the line and sent us each on our way. Each line had a specific characteristic depending on the angle. The first one ran hot, which meant it took more braking at the end to slow down. The second line ran cold since it didn't need much braking. The third line, as you can probably guess, was just right. Each of the lines began and ended on a platform in the trees or on top of telephone poles. The fifth line finally brought us back to good ole Mother Earth but we were not there for long. 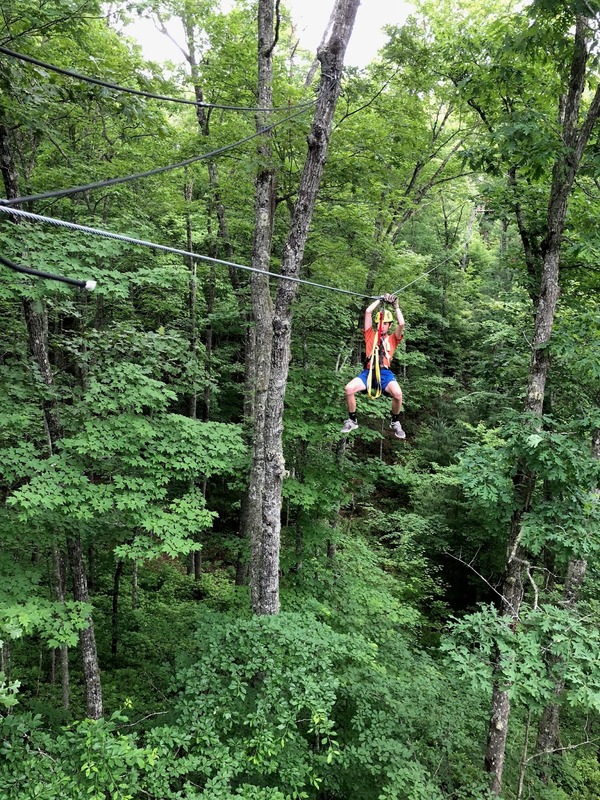 The sixth zip line was the longest, stretching for almost half a mile. 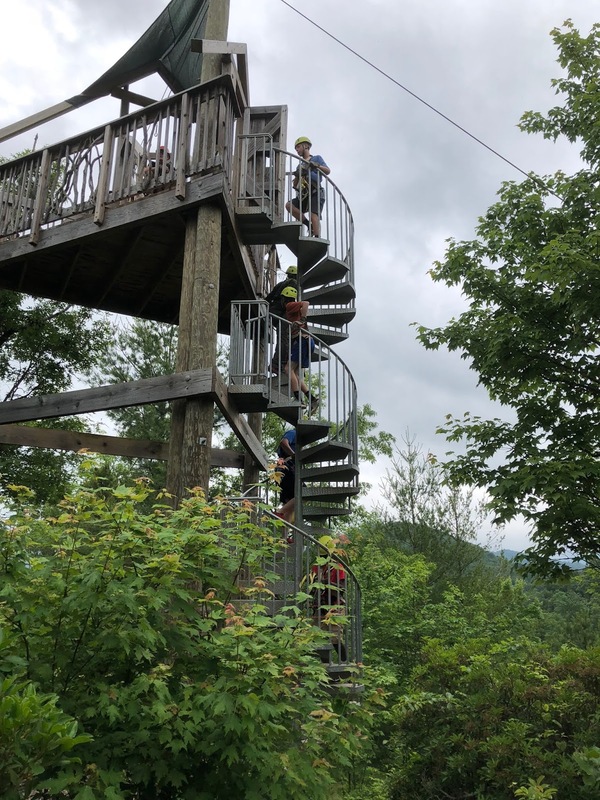 The guys climb the tower to the start of the half mile zip. Our group poses for a photo at the top of the tower. The zip line disappears into the distance. The guides informed us that we would have quite a view as we traveled down this line. 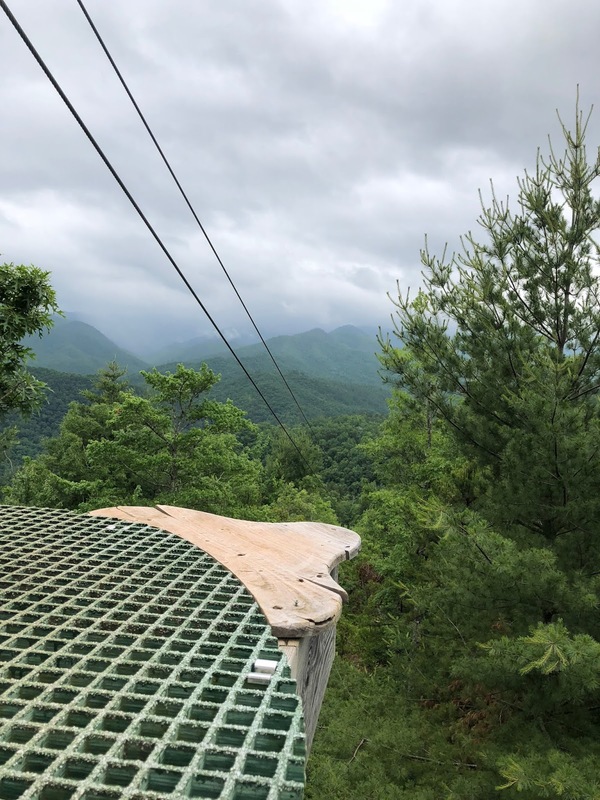 in addition to the mountains and Fontana Lake, the view downward was also spectacular. At one point we were 340 feet off the ground as the mountainside sloped downward to a ravine. The previous lines had only taken us about 15-20 seconds to cross. The traverse down half a mile took 45 seconds. We were also instructed to pull our legs up and our elbows in to reduce wind resistance as we zipped. This was intended to ensure that we maintained enough momentum to reach the platform at the end. 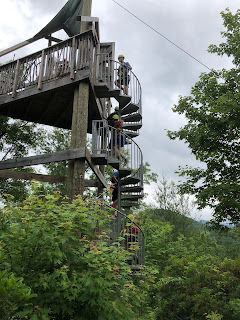 Unfortunately, despite the fact that we were zipping at a speed of around 50 mph, none of us were able to reach the platform and had to pull ourselves hand over hand the last few feet. After the experience of the mega-zip, the last two zip lines seemed anticlimactic. Following a drive back down the steep road, we turned in our gear and enjoyed another leisurely lunch beside the river. We are now headed back to Camp Daniel Boone where we can visit with the rest of the troop and engage in some afternoon programs at the camp. However, my first act upon arrival is to convince some of these scouts to take a shower and put on clean clothes. Some of them appear to have foresworn bathing for the week. Wish me luck. The photos for today are found here.